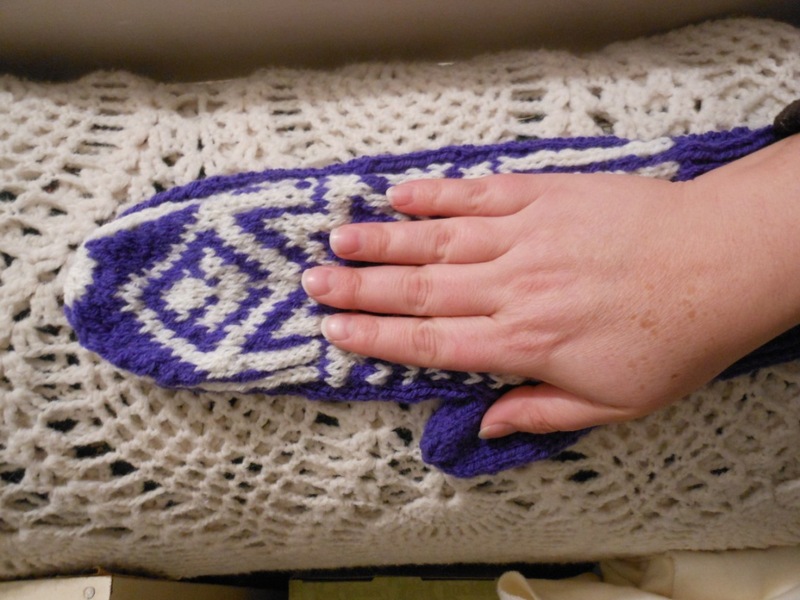 How about an actual post with knitting and crocheting content? Since I mention them in my blog title? Well, how about…. I learned to do the knit stitch when I was relatively young, I suppose 9 or 10. But my mom only knew how to do the knit stitch, and I couldn’t figure out how to do the purl stitch from looking at the Readers Digest Guide to Needlework. * So I diligently knitted my mom horrible misshapen dish cloths our of who knows what kind of yarn (whatever was in her yarn bag) and continued to develop my skills in hand embroidery, latch hook, and sewing. About 20 years later, living in Utah, that seemed to be a fine place to learn to crochet. I learned I was going to be an aunt for the first time, and I wanted to make stuff. I couldn’t get any further than the chain stitch by looking in books, so I took a class at a local store. All I really needed was to see someone do stitches with their hands, rather than from a picture in a book, and I took off. So, if you have been trying to learn, I encourage you to either take a class from a live person, OR look at the many YouTube videos which are now available. I made many, many double sided pot holders, which had been a specialty of my Grandma, and crocheted edges around baby blankets, and then eventually did the whole baby blanket. I still prefer to make baby blankets by crocheting rather than by knitting, because it is much faster. In 2005, after we had moved to Colorado, I took a knitting class. This was both good and bad, because I did learn to do the purl stitch, but the the other students in the class didn’t even know how to make a slip knot, so the teacher was busy working with them and not noticing that I twisted my purls. It took another class with a different teacher to find that out. Since then I have moved on to continental knittting (FASTER!) and twisting my purls is no longer a problem. I have other problems, like widely variable gauge, a cat who bites through my yarn, too many projects to do and too little time, etc. etc. 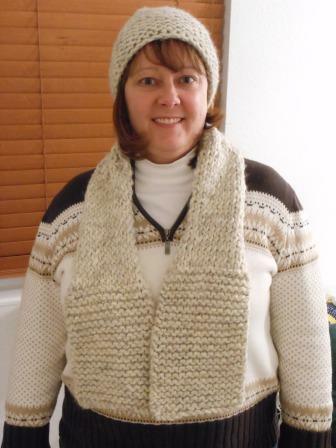 Here is a picture of my first real knitting project – a hat and scarf. I am keeping them, because, you know, 1st knitting project. Crocheting – I know we had to make a doily for that class. I DON’T know where it is currently located. It was a small doily, but it was not a simple pattern. This teacher expected you to learn and learn fast, and get your projects done. Here is a knitting project I keep on my wall to keep myself humble: And to remind myself to check gauge. And to proceed with extreme caution when using vintage knitting instructions. How about a hand for scale? * There are probably many, many more up-to-date needlework books out there, but I still pull this on out quite often. So often that it lives in the living room bookcase instead of in the craft room. Mom and dad got it for me at an auction – best gift ever! Still available on Amazon, although I think now you can get a “classic” one with the dated looking cover, or a newer one. I haven’t seen the newer one to see if they updated the 1970s type patterns inside. 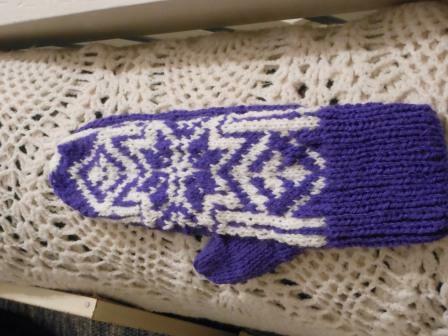 This entry was posted in Crocheting, Knitting by glenderella. Bookmark the permalink. I hate checking my gauge. This is a good reminder to do it anyway! Ah! Gauging! One of the many reasons why I weave rather than knit! Nice to know you persevered .. I think I might have been the recipient of one of your dish cloths.